The April 15 filing deadline has passed and plenty of time remains for clients on extension. Another deadline is quickly approaching, however. For tens of thousands of Florida residents it may mean the difference between peace of mind and criminal prosecution. Aug. 31 is the deadline to participate in the IRS's offshore Voluntary Disclosure Initiative (tax amnesty). If you think this doesn't apply to any of your clients or couldn't affect your practice, read on. The IRS launched its first major offshore amnesty in 2009. That program yielded just 15,000 participants. 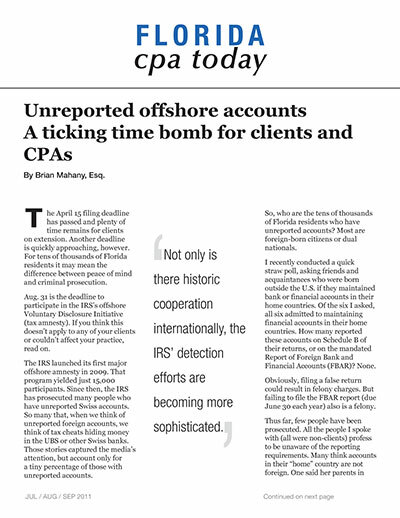 Since then, the IRS has prosecuted many people who have unreported Swiss accounts. So many that, when we think of unreported foreign accounts, we think of tax cheats hiding money in the UBS or other Swiss banks. Those stories captured the media's attention, but account only for a tiny percentage of those with unreported accounts. So, who are the tens of thousands of Florida residents who have unreported accounts? Most are foreign-born citizens or dual nationals. I recently conducted a quick straw poll, asking friends and acquaintances who were born outside the U.S. if they maintained bank or financial accounts in their home countries. Of the six I asked, all six admitted to maintaining financial accounts in their home countries. How many reported these accounts on Schedule B of their returns, or on the mandated Report of Foreign Bank and Financial Accounts (FBAR)? None. Obviously, filing a false return could result in felony charges. But failing to file the FBAR report (due June 30 each year) also is a felony. Thus far, few people have been prosecuted. All the people I spoke with (all were non-clients) profess to be unaware of the reporting requirements. Many think accounts in their "home" country are not foreign. One said her parents in China set up an account for her there. Another said he owns three rental properties in his home country, Australia, and used the account there to pay bills and collect rents. Although criminal penalties of three to five years per filing year are a deterrent to many, the probability of prosecution for these "innocent" violations is quite low. The civil penalties are another story, however. What are the chances of getting caught? They're increasing every day. In the last two years, the U. S. has executed several tax-exchange agreements with foreign governments. The Organization for Economic Cooperation and Development maintains a list of uncooperative tax havens. As of last year, there were no blacklisted countries. There still are several jurisdictions where cooperation is poor, but all countries now have signed tax-exchange treaties or have pledged to cooperate. Not only is there historic cooperation internationally, the IRS' detection efforts are becoming more sophisticated. The newest tool is a "John Doe" subpoena in which the U.S. Government subpoenas all records from a foreign bank relating to known U.S. taxpayers, or those with U.S. addresses or with extensive debit card in the U.S. Recent enforcement efforts targeted at HSBC Bank have yielded two criminal prosecutions of Indian Americans with accounts at HSBC India and one prosecution of an American with an unreported account HSBC Bahamas. The estimate of Americans or U.S. taxpayers who have unreported foreign accounts is between 500,000 and 1 million people. With that many people, the chances are good that some are your clients. Each year we routinely sign off on returns, including returns on which the "no" box is checked in response to the Schedule B question regarding foreign accounts. Many CPAs don't understand the FBAR requirements and the current amnesty program. When amnesty is over, there may not be another chance for taxpayers to avoid prosecution and loss of half their offshore accounts plus possible tax, interest and penalties on any unreported interest income. Don't let those upset taxpayers blame you. The current amnesty ends Aug. 31 but it is complex and involves a considerable amount of paperwork. Under the current rules, there must be a good-faith attempts to complete the amnesty package by Aug. 31. A 90-day extension is available, but only for people whose applications are substantially complete by the deadline. Now is the perfect time to educate clients and potentially save them from jail and certain financial loss. It's a good time for you to avoid grief and aggravation, too. Participants in the amnesty avoid prosecution and may pay only a 5 percent, 12 percent or 25 percent forfeiture, instead of losing half their account balance.